"..the major event of the twentieth century has been the abandonment of the values of liberty on the part of the revolutionary movement, the weakening of Libertarian Socialism, vis-a-vis Caesarist and militaristic Socialism. Since then, a great hope has disappeared from the world to be replaced by a deep sense of emptiness in the hearts of all who yearn for Freedom...."
As Camus says, a deep sense of emptiness is felt by all those who wish for a revolution leading to the creation of a society which is classless and truly socialist. As the history of the 20th century has unfolded we have witnessed the repeated failure of vanguards and leaders to create the society for which the true-hearted revolutionaries have fought and died. Not so long ago most of the left held up the Soviet Union as an example of Socialism or something with some socialist features. As the Eastern Bloc crumbled and the true horrors of sick states like Ceaucescu's Romania were exposed Cuba became the new Mecca for the left. What we find there is unfortunate and there is little to inspire us in the country which has had Fidel Castro at the wheel of power for over 30 years. Cuba, about 90 miles off the coast of North America, is the largest of the Caribbean islands. The social services are in a far better condition than they are in other Latin American countries. Virtually every Cuban under the age of 30 can read and write. But the cost of these benefits is high for the working class who have never been in the saddle of power in Cuba. This is not their role as the doting Father looks after their interests. While the figures about literacy and health are good there are a number of statistics which aren't so impressive. One Cuban in every 340 is in prison. There are 400 political prisoners. Around 50% of the Cuban male population are known to the police or have criminal records. The Cuban police force regularly carry revolvers, tear gas and electric truncheons. The crime rate itself is very low, so the equipment of the police and the jail population would seem to indicate a state that is repressive in it's dealings with the people. To understand how Cuba functions now, why it developed the way it did and why socialism was never on Castro's menu, we must look at the origins and path of the revolution. Fulgencio Batista y Zaldivar had taken control of Cuba in a military coup called the 'sergeants revolt' on September 4th 1933. He promoted himself to the position of Commander in Chief of the armed forces and comfortably ruled through a host of puppet presidents. Batista contested and lost the presidency 1944, after which he exited to Florida with millions from the small country's coffers. He returned to power in a coup d'état in 1952, three months prior to the presidential elections. An interesting point to note is the cordial relationship between Batista and the Cuban Communist Party. They were allowed to function openly and supported Batista's candidates in the 1940 elections. As their reward they got control of the state controlled trade union, the Cuban Confederation of Labour (CTC-Confederacion de Trabajadores de Cuba). The First Secretary General was Lazaro Pena, a post he would later hold under Fidel Castro. The 26th of July Movement [Fidel Castro and Che Guevara's guerrilla organisation] was born out of an attack on the Moncada military barracks in 1953. The attack, though brave, was bungled and failed. The movement really grew during the subsequent trial where Castro successfully gave the impression of the July Movement as being nationalists who would no longer be restrained. The July 26th Movement grew in prestige from the trial of the Moncada attackers. Two years later, after the movement had been in exile in Mexico where Castro met the young Che Guevara, they returned on the "Granma" pleasure cruiser in December 1956. The 80 strong insurrection failed in the Oriente region and they retreated to the Sierra Maestra mountains. It is here according to the folklore historians, whom Castro had later appointed, that the discussions of Marx and Lenin took place into the long hours amongst the revolutionaries around the camp fires. By 1958 the Batista troops had retreated to their barracks. The rebels stepped up their attacks. There was broad popular support for the 26th July Movement, and mass strikes and demonstrations followed. (Che Guevara said that the Batista regime collapsed under the weight of it's own corruption.) Many who weren't in the July movement lost their lives, yet they seem to be forgotten in the process of deification which has taken place around Castro. There was the raid on the Mantanzans garrison in which all the young members of the radical nationalist Autentico Party lost their lives in 1956. Then there was the attempted assassination of Batista in 1957 by the Revolutionary Student Directorate. All of them were massacred. It is important to remember that the Cuban revolution was the work of a few armed insurgents. It was the work of a few hundred armed guerrillas in the Sierra Maestra mountains and various other rebels. The working class supported the rebels but it was a passive support that did not extend beyond strikes and demonstrations when the dictatorship was close to crumbling. "The emancipation of the working class is the task of the workers" and unfortunately in Cuba true emancipation was not to follow the revolution. Following the toppling of Batista the first cabinet contained a judge, a lawyer, the head of the Havana Bar Association, a member of the Orthodox Party, and the ex-president of the national bank. (Within 14 months all of these disappeared to the USA and became 'contras'.) The 1940 constitution was reinstalled. The first office set up was the National Tourist Board. All this would not seem to indicate a very socialist revolution had taken place. In April 1959 Castro went to America to visit and talk with vice president Richard Nixon about securing a development loan. Castro made assurances to the White House about protection of American interests but he stood firm on Cuban sovereignty. However, even the demands for very limited economic control were against US interests and therefore Cuba was portrayed as part of the "world communist conspiracy". The imperialist USA set out to smash small independent Cuba. 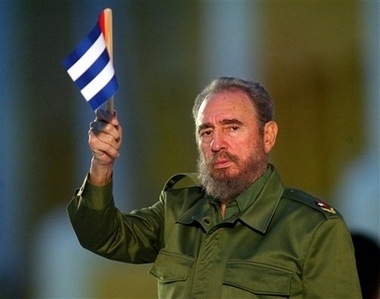 The Americans had wanted Batista to capitulate to a caretaker government before Castro could come to power. They were never really prepared to do business with the man. The further down a road one travels the less options one is faced with. Castro had reached a 'T' junction. The first road would have been to concede sovereignty to the Americans and keep a section of the old ruling class on his side. The second road was to industrialise the country, using the confiscated wealth of the ruling class. Cuba was going "Socialista". In October 1959 Che Guevara becomes head of the National Bank. In February 1960 a new agreement is reached to supply sugar to the USSR. In July of the same year Castro nationalises American owned sugar companies and oil refineries. By the end of the year few foreign industries are not nationalised. Castro had made a decision, America had refused to budge an inch and now it was time to side with the other major power. So began the myth of the July Movement always being Marxist. As the plaque reads at Havana's main cemetery "What the imperialists cannot forgive is us having made a socialist revolution under the very noses of the United States." It comes as no surprise to learn that Castro chose to call himself a Marxist-Leninist. "I am a Marxist-Leninist and will remain one until the last day of my life" said Castro in 1961. This is a good political philosophy to adhere to if one intends to remain in power for 30 years and never release the reins of control to the working class. How does Cuba function? On this Caribbean island you have a ruling class composed of the bureaucracy which came from the July 26th Movement. You have the remnants of the Stalinist Partido Socialista (Cuban Communist Party) who saw the Revolution and the nationalisation that followed as a means to strengthen their positions. To the Cuban Communists their own survival is paramount, principles were abandoned as unhealthy a long time ago. Then you have the professionals such as academics, scientists and management. They have fewer privileges than their counterparts in the 'West' but are rewarded with praise and prizes as long as they remain uncritical. The ruling class is bonded together by a fear of the working class. Castro is the cement which holds Cuban society together. As Che Guevara wrote "It is true that the mass follows it's leaders, especially Fidel Castro, without hesitation but the degree to which he has earned such confidence is due precisely to the consummate interpretation of the peoples' desires and aspirations." 6 This is the cult of Castro's personality which cannot be underestimated, he is the consummate master of telling the people what they wish to hear. As rumblings of discontent come from the working class about the bureaucrats, they still look to the father figure of Fidel to deal with the nasty bureaucrats. The 'internationalist' policy of armed support for nationalist regimes in Africa and the scientific work all gives credence to the popular story of one little island standing strong against the wicked winds of imperialism. The economy of Cuba has been distorted for years so that it is like looking at something at the bottom of a pond. The funds from Russia are drying up. The Cuban cigars are partly filled from Bulgarian tobacco. There is little to be said when you find out that there have been sugar shortages in a country where about 50% of the economy is based on this crop. The embargo is blamed for everything covering vast areas of inefficiency. Trading has been going on with the USA for years through a series of front companies. When the squeeze had to be put on in the 1980's Castro, "El Lider Maximo", came up with the process of 'rectification'. This ingenious plan involved going back to the past and digging up the immortal legend of Che Guevara and returning to a 'high moral socialism'. Castro came up with such perils of wisdom as "Perhaps one of the most difficult aspects of rectification has been to persuade the workers to give up the excessively high wages stemming from implementation of outdated norms, or erroneous criteria". When one distils the true meaning from such pedantic language, we get the old maxim, work harder and ask for less. The words of a leader who is prepared to squeeze the working class more rather than attack the inequalities of the society which he helped create. The Cuban regime is called many things as people try and categorise it, and excuse it for its policies and glaring faults. The working class did not create the revolution and they have been crippled since Castro and his cohorts installed a new bureaucracy. The aspirations of the workers are low and so is their confidence. However, as you can ascertain from the steps preceding and following the revolution Castro did not set out to even create 'socialism on one island'. Recognising that Cuba is not 'socialist' does not mean, however, that anarchists and socialists ignore the U.S. blockade of the island. This attempt to starve the island of even medical supplies is yet one more attack on the working class. The Washington government are happy to squeeze the ordinary people of Cuba in the hope that the resultant discontent will lead to Castro's overthrow. The American ruling class hate his regime, not because it is some sort of 'socialist' paradise but because its very existence challenges Washington's political monopoly in Central and South America. Their hope is to replace Castro with a government obedient to their wishes, like those of Guatemala or El Salvador. The revolution was nationalist inspired and Castro adopted the political ideology of Leninism to suit his needs after his courtship of American investment had failed. The working class in Cuba need to unite and fight the ruling class who reap the rewards from their island. Those who see something inspirational in the way Cuba functions today are those blinkered to the possibility of the only true socialist society, one where freedom and equality are central. *. All statistics quoted in the remainder of this paragraph are taken from Analysis, Winter 1991-1992. 2. Castro's Revolution (New York 1964) p.35. 3. Granma (Cuban paper) 28th December 1975. 5. Cuba, an American Tragedy (R. Sheer & M. Zeitlin) Penguin 1964. p. 63. 6. Venceremos, the speeches and writings of Che Guevara, London 1968 p.388.